Treasure C.H.E.S.T. 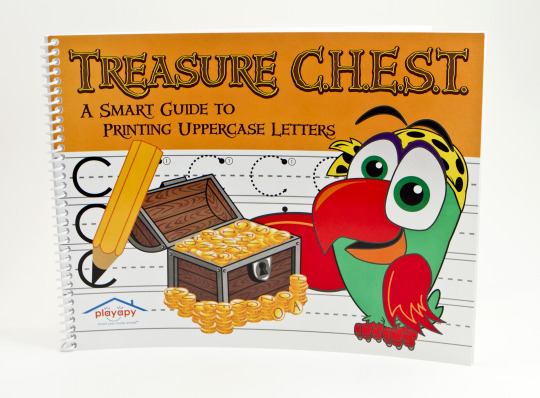 : A Smart Guide to Printing Uppercase Letters - Playapy - Playful Solutions. Powerful Results. Treasure C.H.E.S.T. : A Smart Guide to Printing Uppercase Letters was developed to improve the handwriting of children by providing specific therapeutic techniques. One of the most common errors that occur with children’s handwriting is the formation and directionality of letters. This refers to the direction the child moves the pencil to form letters. Since all uppercase letters begin on the top line, it makes sense to associate letters by groups according to the curved or straight lines used to form them. The uppercase letters are separated into six groups to help children relate the letters to common objects. In addition, seven action word phrases are used to help a child memorize how to form individual letters. This provides a multi-sensory approach as the child feels the motion of the pencil, hears the words, and sees the strokes as they are being formed into letters. In addition, there is a helpful mascot cheering along as a child works his or her way through the book. This workbook was created to help parents, educators, and occupational therapists. Its concept is smart and effective and can be introduced as early as 4 years of age when children typically begin to draw simple shapes. However, it is most effective when started around age 5 or when a child is able to neatly and easily copy strokes on command and has strong foundational skills including a functional pencil grasp. It is meant to be completed before its companion workbook for lowercase letters. The 26 uppercase letters of the alphabet are separated into six formation groups that spell out the acronym CHEST: Clocks, Hats & Hooks, Ears, Slides, & Trees. C is for Clocks. These 5 letters curve around like a circular clock: C G O Q S.
H is for Hats. These 5 letters have a line across the top like a hat: E F I T Z.
H is also for Hooks. These 2 letters curve up like a hook: J U.
E is for Ears. These 4 letters have a bump on the right side like an ear: B D P R.
S is for Slides. These 5 letters slide down to the side like a playground slide: A V W X Y.
T is for Trees. These 5 letters zip straight down and have branches like a tree: H K L M N.
The 26 uppercase letters of the alphabet can be formed using seven simple phrases called Action Words: Curve Around, Make an Ear, Make a Hook, Slide Down, Slide Up, Zip Down, and Zoom Across. Next, each letter will have a page within a group. Action words printed in bold should be said aloud to guide the child. 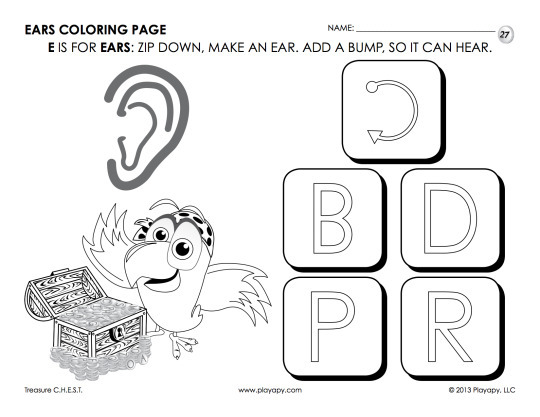 Using a parrot voice makes it more fun and encourages the child to say the words as well. Visit www.playapy.com to purchase the award-winning Treasure C.H.E.S.T. and its companion workbook Heads, Tummies, & Tails: A Smart Guide to Printing Lowercase Letters. 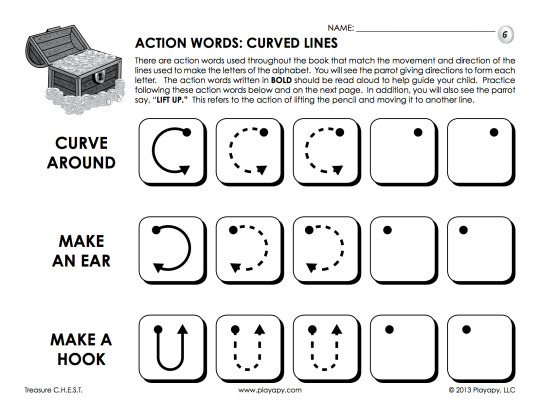 Watch this video for an example of a child using the Action Words.